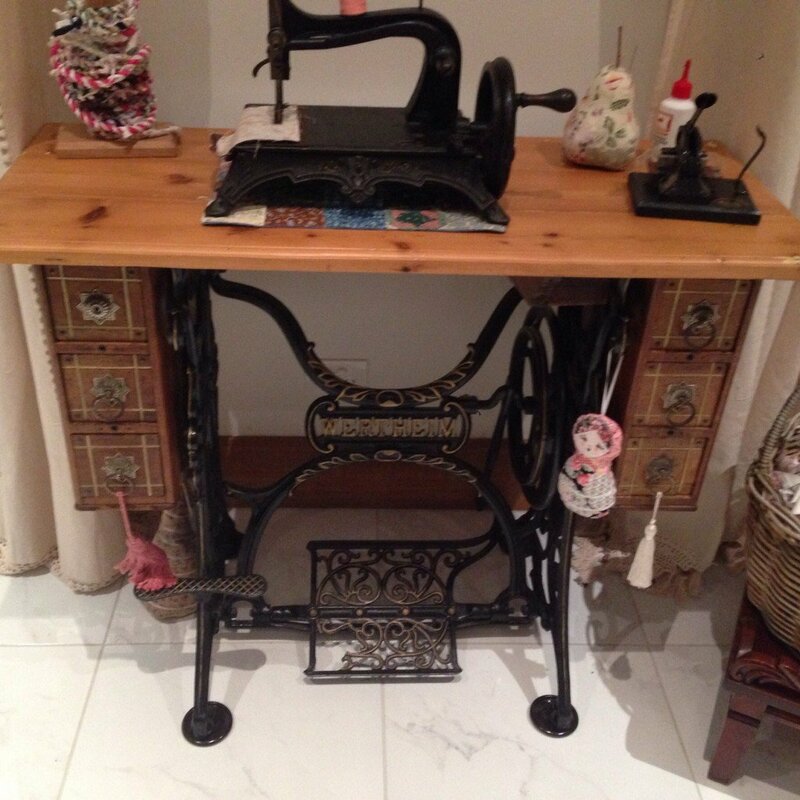 Antique and Vintage Sewing Machines. In recent years, with a society turning to minimalism, vintage and antique sewing machines have fallen out of favour, especially as decorative items. When grandma dies, some of these sewing machines and sewing machine cabinets, find themselves gathering dust in second-hand shops. Often they are of no real value to the family. If they are exceptional of course they will always be in demand by collectors. Many years ago I bought a second-hand Wertheim machine, set in ornate cabinetry an auction. Unfortunately, it had been living outside on a verandah in all-weather for about 40 years, so the table had significant damage. I’m sorry to say that the top was un-salvageable, which was sad because it had beautiful inlay in the timber. I’m also sorry to say that because the table top was so damaged, I didn’t believe that I could keep the machine either. My father helped and made me a new top from recycled Baltic flooring. I was so pleased with it. I still think it’s a great occasional table. I have to say at that time it didn’t really occur to me that the machine might have been usable. What I”m getting at is, not only are they beautiful. The machines can be very usable. 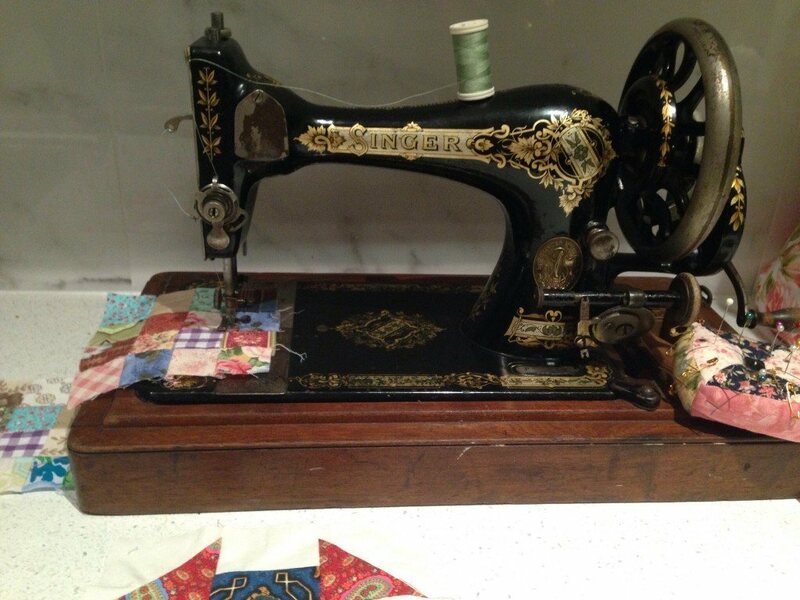 My sewing experience back then, was about dressmaking, so a modern machine was more appropriate. 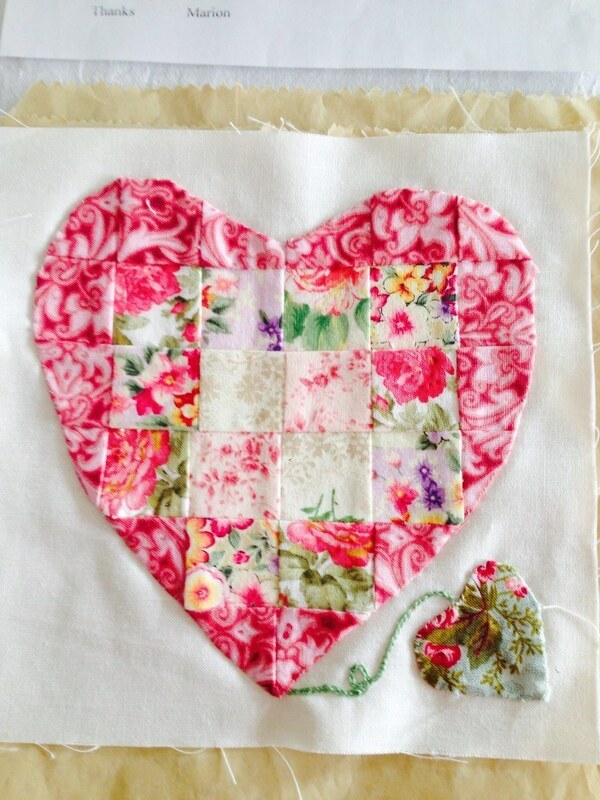 However, when it comes to quilting, it’s a different experience whereby most of the sewing is straight sewing. I enjoy all of the processes involved with piecing and quilting, but it became apparent, that having only one machine can be a little frustrating. This became especially evident, when I began to machine quilt my own quilt tops. Once the machine is set up for quilting, nothing else can be sewn. No piecing, mending, or anything else. That’s when I decided having a back up machine for the quilting would be good. Enter the vintage Singer. 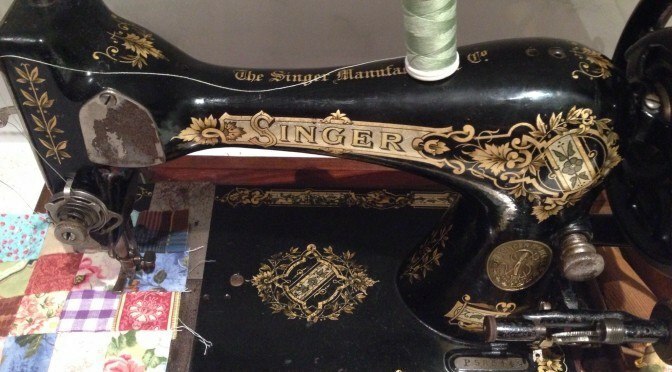 By chance I came across a Singer 1948, 201K with a potted motor, in a little library cabinet, with a knee control. I didn’t think it would work, but I asked the second-hand dealer if it worked. He didn’t know, but willingly dragged it to a nearby power point. He plugged it in and I ran the motor. I’m no expert, but it sounded good. The electrics looked intact. It was dusty and a bit bedraggled, but I decided to take a chance on it. So they delivered it for me. I cleaned it up and polished the cabinet, put in a new globe, and it sews straight stitch sooooo well. I love sewing on it. It’s so heavy and sturdy. I did need to spend some time sorting it out but I managed to get it set up for free motion quilting. It’s great because it’s a flatbed which is perfect for this purpose. If you are a little mechanically minded, this is defiantly something to consider. It’s an extremely economical way to get another machine, for quilting, piecing or straight stitching. Also if your machine needs to go in for service or repair, you have a back up. One other thing, learning to use a treadle machine is good for the brain. Learning a new skill and coordination. It takes a while to get that coordination right and the wheel turning in the right direction, but once you do, it’s like riding a bike. 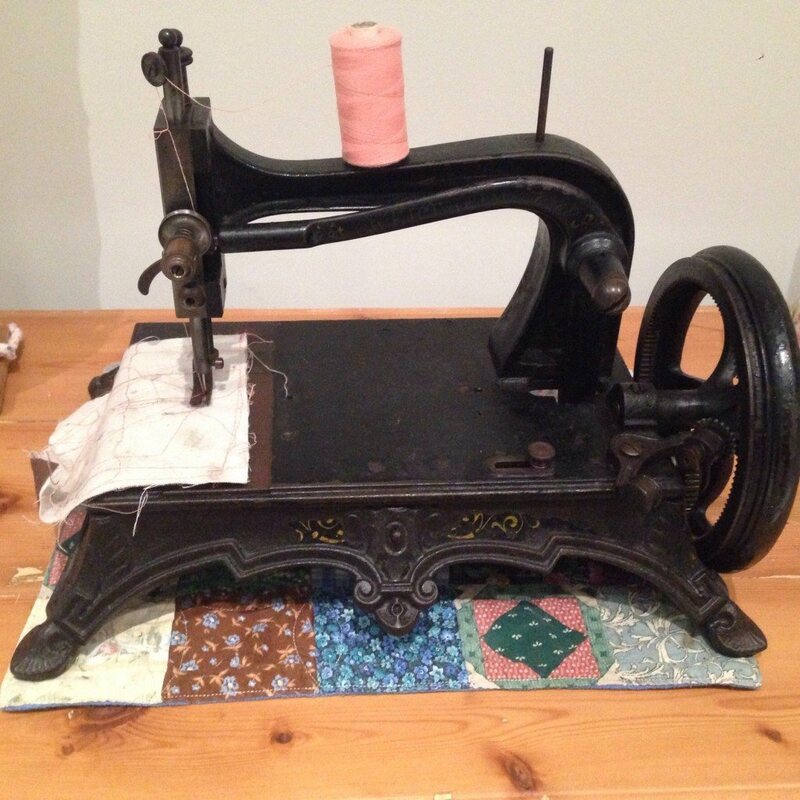 I find using a treadle machine very relaxing and almost therapeutic. It make a lovely sound. I believe it’s psychologically therapeutic doing repetitive motions where there is a positive outcome or reward, like making quilt blocks! Treadle machines and hand crank machines need no power point, so it can live somewhere even where there is no power. You never have to worry about turning it off either.